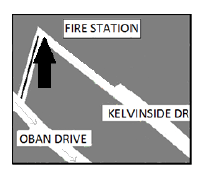 We are organising a community clean-up of Oban Passage, off Oban Drive, on Sunday 16 September. Place: Oban Passage, just down from the fire station. Please join us if you have some time to spare. We’ll provide equipment including litter-pickers & binbags, but feel free to bring your own gloves or gardening tools if you can. We’ll arrange for the litter etc collected to be taken away. Refreshments also provided! Download our flier for 16 September.